This Thai style Spicy Salted Eggs salad or “Yam Khai Khem” is very simple and easy to make it for lazy day. The recipe for salted eggs is here. This dish combination of spicy and salty, both very strong taste. We serve with hot streamed rice or rice soup for soften the flavours. Cut the eggs into 4 sections. Use the spoon and scoop out the egg from the shell. It's the easiest way to remove the shells. 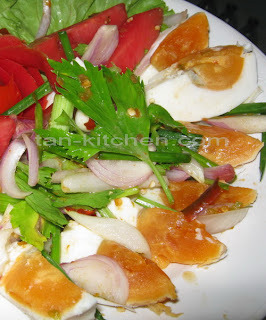 To make a spicy sauce: Put the chilies chopped, sliced shallot, sliced onion, cut tomato into big bowl and mix well. Add Fish sauce, Lemon juice, a pin of sugar and seasoning power to taste and mix together. Place the eggs onto a serving plate, spoon the spicy sauce mixture over the eggs. Garnish with a few Chinese celery. Serve immediately with hot steamed rice or rice soup.